​~~Meets 1st Mon. of month, 1:00pm, at the Stanwood Area Historical Society Museum, 27108 102nd Ave. NW, Stanwood, WA. ​The "CamWoodies" are a group of genealogy enthusiasts from the Camano Island and Stanwood area, hence their name. They are not a registered company or corp. Meetings are open to anyone interested. They are dedicated to helping preserve local genealogical records. They work with both the Stanwood Historical Society and the Sno-Isle Genealogical Society. Records are archived in the Stanwood Historical Society and indexes of surnames and obituaries are published on the Sno-Isle Genealogical Society website. ~~Meets 2nd Saturday of the month, 1:00 pm, except Jul, Aug, Dec) at Burlington Public Library located at 820 E Washington Ave, Burlington WA . Members and visitors welcome at meetings. (access from the lower level parking lot), South Samish Way, Bellingham. Meetings are open to members and invited guests. ​Whatcom Gen. Soc. is a WA Non-Profit Corp. They provide local research services. 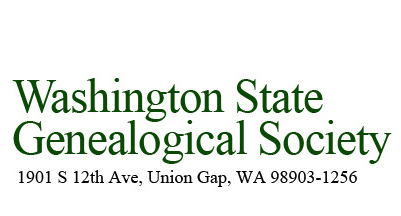 They purchase and provide genealogical materials for the Bellingham public library. Special Collections include: local obituaries; local Civil War Vets and Burials, Cemetery Records, 1904 Census of Bellingham, Blaine Sound newspaper, Index to Roth's History of Whatcom Co. Service area includes; Point Roberts, Blaine, Birch Bay, Lynden, Ferndale, Lummi Island, Bellingham, Maple Falls, Newhalem and Wickersham. ~~Meets 2nd Tues. of month, 1:00pm, (except Jul. & Aug.), at the Heller Road Fire Station, 2720 N Heller Road, Oak Harbor, WA. ​WIGS is a WA Non-Profit Corp. They maintain a collection of genealogy resources. These are held in a private home and available only by appointment. Local research services are available. Their website maintains an online catalog of resources and searchable databases. Service area includes; Coupeville, Oak Harbor, (northern half of Whidbey Island). ~~Meets 2nd Mon. of month; 11:45am educational class, 12:45pm member meeting, at Trinity Lutheran Church, Woodward & Highway 525, Freeland, WA. Meetings are open to members and guests. Guests may attend 2 meetings before being required to join. ​GSSWI is a WA Non-Profit Corp. Local research services are available. Their website maintains indexes to Special Collections including; books published about Island County, Index of Death Certificates 1907-1952, Surname Index, Early Census records, and Obituaries. Service Area includes; Greenbank, Freeland, Langley, Clinton (southern half of Whidbey Island). ~~Meets 1st Wed. of month, 6:00pm workshop, 7:00 pm member meeting. Check the website for meeting locations. ~~Meets 2nd Tues. of month at the SVSG library at 6111 188th Place N.E., Arlington, WA. Meetings are open to the public. Stillaguamish Valley Gen. Soc. is a WA Non-Profit Corp. They are the host of the annual N.W. Genealogy Conference. Stilly Valley G.S. maintains a library which is open to the public. Local genealogical publications are available at their online store on the website. Special Collections include; Pennsylvania Archives Collection (72 books of Colonial and Early Americans), War of the Rebellion Series (159 books of Civil War Official Records of the US and Confederate Armies and Navy), Arlington Times (newspaper on microfilm 1895-current), Arlington High School Yearbooks, Everett/Snohomish Co. City Directories 1901-1990, Arlington Times Obituaries 1895-1985, and the Everett Herald (Snohomish Co.) Obituaries 1960-2006. Service area includes; Everett, Marysville, Mukilteo, Arlington and Darrington. Service area includes Northern Snohomish Co; Marysville, Robe, Silverton, Arlington, Oso, Darrington, Camano Island and Stanwood. ​~~Membership meetings are held annually and for members only. ​IG&HS is a WA Non-Profit Corp. They maintain a library and provide research services. Members have access to online databases.